In 1993, the Fulbright-Hays research award funded my extraordinary journey into northwestern Côte d’Ivoire to find the ideological underpinnings of Manding state formation through a study of Kabasarana, a 19th-century enclave founded by the Toure family. The award also launched a lifetime commitment to internationalization, cultural exchanges, and service that continues to affect my career, family, colleagues, and community. The research led me to libraries, national and local archives, and public performances of traditional music by bards, as well as informal gatherings where men and women elders sang songs they learned from their parents or shared their family histories of migration and Toure conquest. As word of my work spread throughout the region, solicitations came inviting me to local events or to meet with an able-bodied elder willing to share information. Despite the many wars of conquest and French occupation, the peoples of northwestern Côte d’Ivoire strived to maintain many artefacts, oral histories, songs, and literary texts, including the Koran that belonged to the founder, just as one would preserve a property deed, birth certificate, or family bible in the United States. Their respect for learning and seeking knowledge, in addition to their generous spirit and warm welcome, facilitated my work and opened a deeper understanding of Manding culture. I fastidiously recorded and transcribed the lyrics to their songs, and therein found clues to profound ideological beliefs and social drivers. The results of the research has been published in edited volumes and presented at conferences. Fortunately, the Fulbright award takes into account some accommodation for families. I traveled with my 11-year old daughter, who missed the spring semester of sixth grade in the United States to enroll in a class of 72 students that was held in a one-room building with no air conditioning called the “chicken coop!” She learned in French by day and studied her American textbooks in the evening, without competition from outdated Hollywood TV programs. Sometimes she accompanied me into the countryside for fieldwork, sitting beside me in the Mande mud brick huts and thatched roofs. 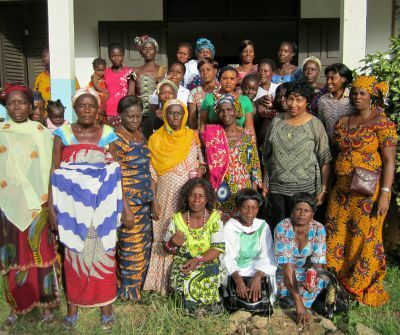 Her ability to adapt to a new environment and find comfort in the African countryside probably influenced her career decision to work in African development. 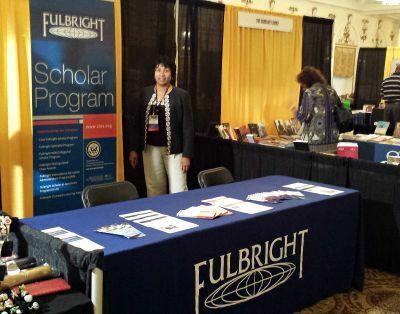 The Fulbright experience also enriched my scholarship and teaching. I have many anecdotes to share with my students, thus taking the learning experience beyond the classroom and textbook and into the western savannahs, as I describe with ease the open markets and explain the dynamism of interregional trade. Although I set out to unearth the formation of a 19th century kingdom, the timing of my arrival, with Côte d’Ivoire in the throes of a national political transition to multiparty democracy, allowed the community to speak freely about the past, unencumbered by long-standing political relations linked to the former one-party government. I found opportunities to interview candidates running for political office and shaped an analysis that accounted for the role of extended family allegiances, historical clan disputes, and the political culture of area. In addition, the experience led to opportunities beyond the academy to share the knowledge I had gained about Côte d’Ivoire with policy makers, diplomats, and development specialists at home. Invitations from the State Department to serve as a panelist in a regional symposium in Côte d’Ivoire and as a speaker for Black History Month in France, Chad, and Niger led to other opportunities to contribute. I served as an expert member on several briefing panels for outgoing U.S. ambassadors, taught courses on French colonial history and African women at the Foreign Service Institute (FSI), and served on the Foreign Service Officers promotions panel. Most importantly, as Côte d’Ivoire launched into the throes of civil war, I was invited to share my observations with the Sub-Committee on African Affairs in the U.S. Congress. I won a grant from the U.S. Institute of Peace to host 15 African women for a workshop on Building a Culture of Peace and Nonviolence. These grants and service activities emerged from the work I accomplished as a Fulbright-Hays Scholar. The spirit of mutual understanding and cultural exchange at the core of the Fulbright experience is contagious. As a Fulbright alumna, I seek opportunities to promote the global engagement among my colleagues, students, and community. I facilitated an exchange to Côte d’Ivoire for my daughter’s classmates and helped her to start the Africa Club in her high school. I have served as Campus Representative for the Fulbright Program at Howard University and collaborated with a study abroad provider to open a Howard program at the University of the Western Cape in South Africa. While serving as Secretary on the board of the West African Research Association (WARA), I worked with colleagues across the academy to create an American Overseas Research Center in Dakar. In collaboration with Michigan State University, WARA won a three-year grant to train African librarians and technicians in the internet accessibility and electronic databases. As a Salzburg Seminar Mellon Fellow, I collaborated with colleagues from other Historically Black Colleges and Universities and Hispanic/Native American-serving institutions on internationalization strategies. When the Institute of International Education launched the Brazil Scientific Mobility Program, I prepared the application for Howard University resulting in the matriculation of 37 Brazilian students in STEM, TESL, and global culture courses. Participating in the Fulbright Association annual meetings, serving a term on the board of the local chapter, hosting visiting scholars from abroad and traveling to promote scholar programs as a Fulbright Ambassador keeps me connected to the Fulbright mission. I do this for the joy and delight of seeing students and colleagues share that knowing smile when they return from their travels.